Why is Oakland Planning a General Strike? The demonstrator being carried away at the end of that video is named Scott Olsen. His skull was fractured, and he’s currently hospitalized. According to indybay.org, he suffered injuries to the speech center of his brain and is having trouble speaking. The incident has become a rallying cry against police brutality, and has mobilized Occupy Oakland to take their demonstrations one step further. Two days after the incident, the Oakland General Assembly voted to institute a General Strike and Mass Day of Action on Wednesday, November 2nd. The resolution to strike was passed in the General Assembly with 96.9% approval. You can see the vote here. The gist of a general strike is to close down a city’s economy for the duration of the strike. People are asked to close down their businesses and not attend work. Teachers and students are asked to not attend school, or to walk out of school. General strikes have had their impact on many of the rights and liberties we enjoy today, like certain wage rules and worker environment regulations. If you’re in Oakland, don’t go to work. If you own a business, close it down for the day. If you’re not able to do either of those actions, don’t buy anything – not a single thing – on Wednesday, November 2nd. If you have the time in your day, converge on downtown Oakland to stand (and march!) in solidarity with the movement. According SFist, the place to convene in Oakland is 14th and Broadway at 9 a.m, 12 noon and 5 p.m. on Wednesday. They also report that, “labor union SEIU Local 1021 and the the teachers of the Oakland Educational Association” have endorsed the strike and will be rallying with the Oakland Occupiers all day on Wednesday, so be prepared for crowds. Read more on Oakland’s general strike on OccupyOakland.org. 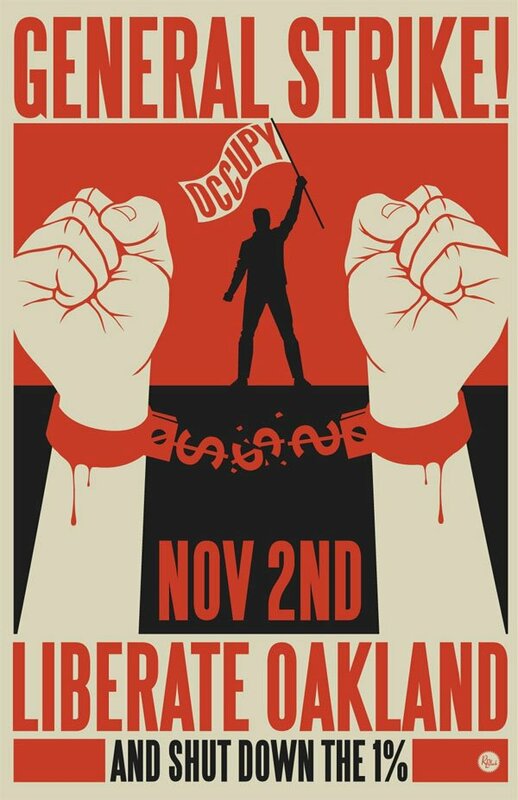 In New York City, Occupy Wall Street will march in solidarity with Occupy Oakland. The solidarity march will leave from Liberty Square, and will take place from 5p to 7p. Isn’t a General Strike Antithetical to the Movement’s Purpose? Some folks have expressed concern that local, privately owned businesses will be adversely affected by the strike. According to SFist, Occupy Oakland’s proposed strike “intends to close all banks and corporations for the day, while calling on laborers, teachers and students to join.” So, the strike may have an adverse effect on privately held businesses, however the focus is on banks and corporations. Whatever the impact on revenue, they’ll be felt more significantly by larger corporations. Think about the impact on revenue a one-day general strike will have on a private bookseller, for example, as compared to the mega-losses a Barnes & Noble might face. Additionally, general strikes through history have been indefinite, taking an “as long as it takes” attitude, but Occupy Oakland’s proposed strike calls for just one day. The real power in a general strike is the message it sends. In this case, Oakland will be sending a message to the monolithic corporations OWS opposes. It’s a look at what The People can do. It’s a reminder that they rely on us, and not the other way around. why are’nt OWS occupying congress over fanny mae executives receiving million $ bonus’s. ?